The City of Sandy takes bike safety seriously. As we build out dedicated bike lanes and other bike infrastructure to the city's transportation system, we strongly encourage citizens to brush up on their safety knowledge and help eliminate avoidable accidents in our community. The following page is dedicated to promoting bicycle safety at all levels, from identifying the rules of the road for cyclists and the motorists that share the road with them to directing you to local sources for bike safety gear. Bicycle Helmet Law ( ORS Chapter 814.485 & 814.486 ) - Oregon law requires any person under the age of 16 riding a bicycle or being carried on a bicycle to wear approved protective headgear. As a parent or person with legal responsibility for the safety and welfare of a child, you will be held responsible. ORS Chapter 814: Pedestrians; Passengers; Livestock; Motorized Wheelchairs; Vehicles with Fewer Than Four Wheels - Bicycle section is from 814.400 through 814.489. Remember, Oregon law states that penalties for driving under the influence of intoxicants applies to bicyclists as well as motor vehicles operators. See ORS Chapter 813 for additional information. Oregon Bike Manual - This free 32 page booklet was produced by the Oregon Department of Transportation and was most recently revised in 2010. Pedal Power: A Legal Guide for Oregon Bicyclists - This 2012 legal guide book for Oregon cyclists was written by Portland "bicycle attorney" Ray Thomas. Brought to you by the Bicycle Transportation Alliance. Otto's Ski & Mountain Bike Shop : Otto's offers a variety of mid-range to higher end helmets and gloves, and also does daily rentals for helmets - even if you're not renting a bike from them. Sandy Bicycle : Offers a wide variety of helmets including full face helmets, gloves, elbow pads and knee/shin guards. Can order specialty safety equipment upon request. Selection is seasonal. 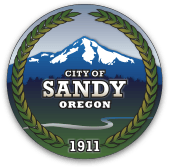 Sandy Fire #72 : The Sandy Fire District sells bike helmets on the third Thursday of every month - no appointment necessary - at their main station at 17460 Bruns Avenue in downtown Sandy. They will also properly adjust the helmets for the rider so that they fit correctly prior to use. Bike helmets for ages 1 and up are available for sale for $10 each. All purpose outdoor recreation helmets also available. Be predictable - Ride with the flow of other vehicle traffic. ( ORS 814.400 ) Maintain a straight line of travel whenever possible. Ride aware - Approach all intersections with caution. Cyclists riding in a bike lane have the right of way, but turning vehicles may not see you. Be seen, be safe - A front white light and a rear red reflector are required by law when riding at night or in low visibility conditions. ( ORS 815.280 ) In addition, we recommend a rear red light and bright or reflective clothing and accessories. Keep an ear clear - Increase safety and communication by leaving one ear bud, or both, out when you ride. Check before you turn - Get in the habit of checking your side-view mirror before every right turn in case a cyclist is overtaking on your right. Brought to you by our friends at the Portland Bureau of Transportation.